Thank you all so much for your lovely comments during the Blog Hop Easter Treasure Hop. I love taking part in these blog hops..so many new blogs to discover! How are you all feeling? Did you over-imbibe with Easter goodies? I was very good. One bar of chocolate and a taste of my son's Eco Friendly Orange Easter Egg..it was lovely and now my son has been very good and he's hidden the rest of his chocolate so I can't be tempted! I have very little will power when it comes to sugar! Well, it has been a busy Easter. What first I wonder? Should I show you my new finish or should I tell you about my adventure as Superwoman? Ah what the heck..Superwoman it is then! On Sunday my hubby and I decided to take MIL to Lough Key, in Boyle (of Moon Boy fame). On the way I saw a cow in the river. I alerted hubby who, being a townie, told me it was probably cooling off. As I'm not a townie, I made him turn around and we went in the field to look. Yes, the poor cow had fallen down the embankment and was stuck. The river was really deep and seriously muddy and she'd obviously been there for a good while. We managed to stop a passing car and the two men in there helped us try to get her to a safer part of the bank. She was exhausted though and I was losing my temper rapidly with the men. I wanted to put a rope around her horns to help keep her head up and then guide her to the flat part of the bank on the other side. They were bloody useless and just kept throwing stones at her. Eventually my wonderful hubby got them to realise I did mean all my threats re: animal cruelty charges, and they went to get the cow's owner. He, thank goodness, was a completely different kettle of fish. He got the calf to go down to her so it's calls would encourage her, and he stayed by her side. By now she had been in the water for over forty minutes from us getting there: no idea how long she had been in before that and the water had to be freezing. I was so worried she would die. Well, I realised there was little I could do: the owner was joined by three of his sons, so I went with a little word reminding them of what day it was (Easter Sunday) and how lovely it would be to see her in the field when we drove past later on and off we went. When we came back I told hubby to drive fast so I couldn't see if she was dead...I couldn't resist a glance back though and Wahey!! There she was in the field with her calf! So I made hubby turn around and drive me back so I could get a photo of her. And someone passing must have called her owner because he drove down to meet us and thank us. He'd let her rest for half an hour, though kept her on her feet and she somehow got the extra energy to get up to her calf. 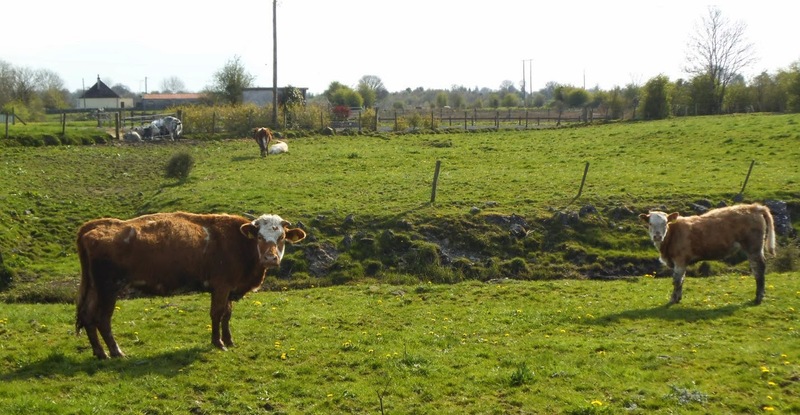 Her owner was lovely and all I can say is thank God, cus there are some cruel beggers here who would think nothing of dragging her out by tractor to avoid paying for the fire brigade, no matter how it would damage the poor cow. He was really pleased we had stopped and I am very grateful to have a hubby who is used to my mad cap rescue schemes..he supports me so much in everyway! Here she is, a little subdued and a little wet but drying out nicely. I have unofficially called her Mary. 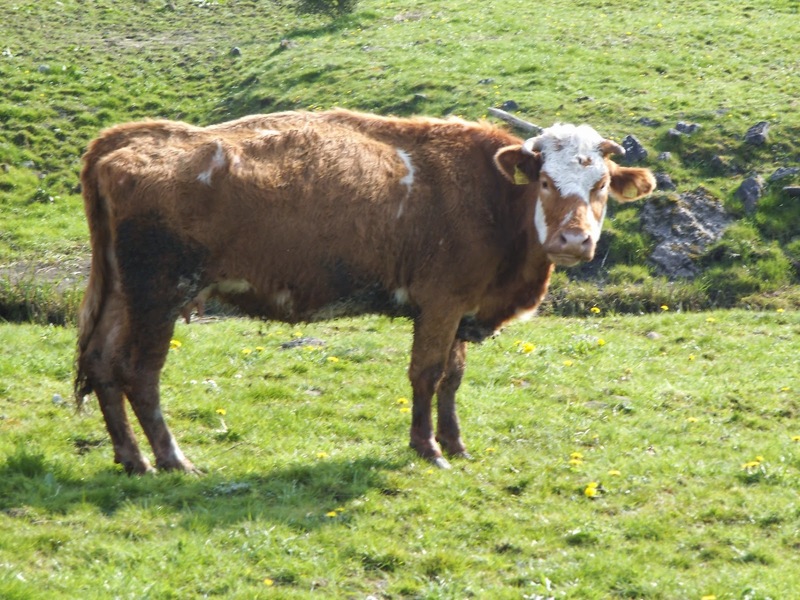 She looks a little scrawny but it's only because she's been feeding her calf over the winter. She'll soon get her condition back. You can see the river bank behind her: it is a good 15 foot drop down! And to the left is quite a busy road, so how come no one else did anything about her?? It beggers belief but hey: it had a nice happy ending. I am adding Cow-Rescuer to my resume! And even more excitement. I've finished my very first proper sampler! I've called it Simply Spring...and yes, I did struggle to get a decent photo but hopefully if tomorrow is sunny again I will get a better one. I finished just as dusk was falling. It was a really fun stitch: nice and bright and who doesn't love ladybirds?? Well I have several mug rugs to make: I want to push myself right out of my comfort zone so I'm exchanging with everyone who wanted to take part! I'll be exchanging with a lady in France, Kaye in Australia, Maggee in the USA, possibly a lady in Finland and Bev in the UK. Each exchange needs one mugrug, one snack from our country of origin and a postcard to show each other where we live (or a photo). I'm so excited! I've done one already and whilst I can't show you yet, I can reveal I've now used three stitches on my sewing machine! Does that make me pro yet? I also have two spring ornies to stitch for exchanges so I've got lots to get on with. Tonight though, I'm going to treat myself to a glass of wine and an hour to read through all you blogs! Yum...care to join me anyone? Have a great week everyone and I hope to have lots to show you on Friday! I do like your sampler - so bright and fresh looking. Woohoo! Superwoman,aka rescuer of cows! So glad there was a happy ending. Lovely new design. It sounds like you have lots of wonderful projects lined up for the week! What a fantastic blog post! You are awesome! God bless you for helping her. 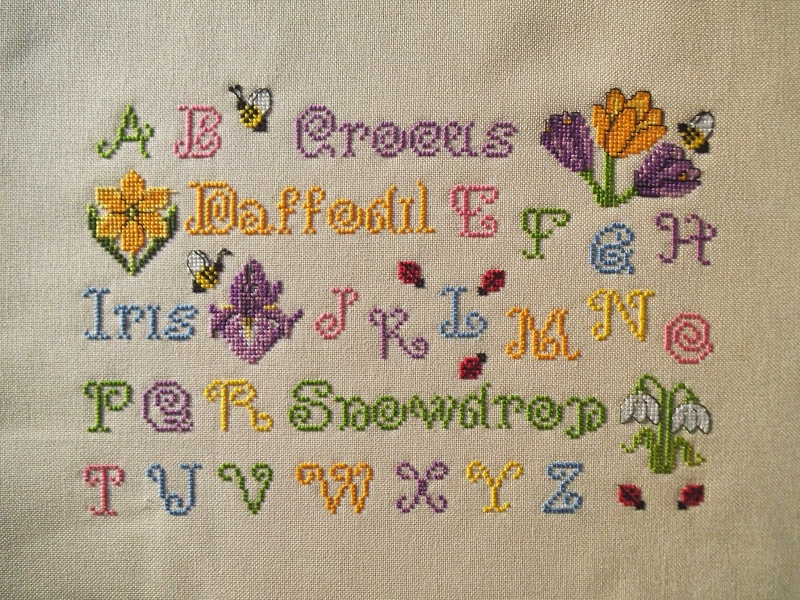 :) What a fabulous sampler dear. Gaynor The Cow Rescuer!! What a great story, maybe this could become an episode of Holmsey and Fergus? 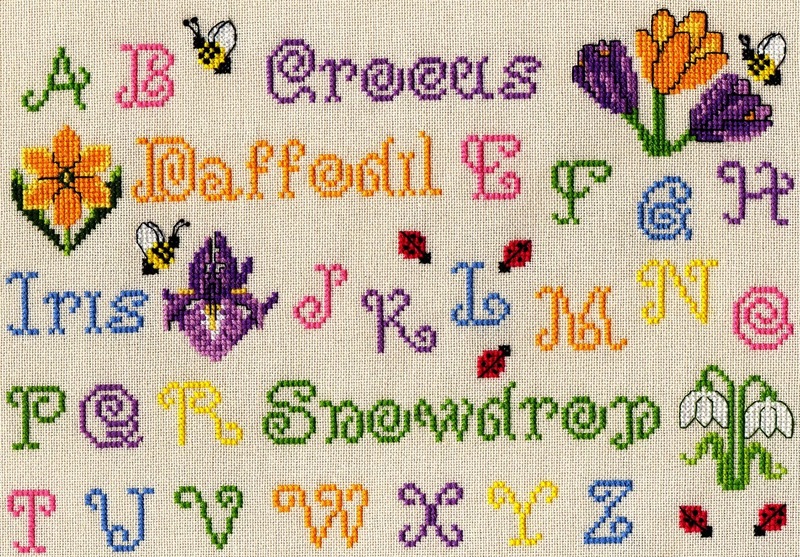 The sampler is beautiful too, such lovely Spring colours. So sweet of you to rescue the cow ... & a marvelous sampler! Mary looks very pleased with your efforts, well done you! You're so brave for sticking for rescuing the cow. Great job! What a beautiful samples, love the colours. What a wonderful, colourful project! I love, love, love your sampler! Hooray for Miss superwoman, Cow Rescuer Extraordinaire! Throwing stones, indeed, very badly brought up, those chaps!